Another major hurricane is devastating the Caribbean and about to engulf communities from Florida up the eastern seaboard. Large numbers of Floridians are evacuating coastal areas. States of emergency have been issued from Florida to North Carolina. Much of Puerto Rico is without electricity today -- parts are expected to be without power for many months to come. Tens of thousands are without safe water already, and the threat of poisonous chemicals -- particularly large amounts of toxic coal ash which Puerto Rico is burdened with -- is likely to emerge in the days to come. Like in Texas and Louisiana after Hurricane Harvey, we know hundreds of thousands of people will be forced to abandon their homes due to catastrophic winds, storm surge, and flooding. While we hope and pray for everyone’s safety, we cannot ignore the fact that many may lose everything. The destruction and heartbreak caused by this hurricane will be found in the days, weeks, months, and years to come - and the recovery will take years. And like Hurricane Harvey -- and everywhere we see the impacts of increasingly intense weather related disasters -- the most vulnerable communities are always hit the hardest. Those below the poverty line, many immigrant communities and communities of color, live next door to toxic facilities. Even before the storm, these communities often experienced polluted air and water. After a catastrophic event, their neighborhoods will be the most in need of resources and recovery efforts. This is why we cannot wait. We must respond with all the tools we have to provide immediate relief and begin the long road toward a just recovery. One that restores communities rather than scattering them to the winds. One that recognizes this as an intersection of social, economic, and environmental justice issues--and that if we don’t hold our principles of equity and justice at the center of this work, injustices will increase many times over. This is why the Sierra Club has chosen to focus our efforts on behalf of those most impacted by this tragedy. And why we will ensure that 100% of all money donated will go directly back to these most affected communities. The Sierra Club will provide support for relief and recovery -- both in donations and services -- to our local partners representing these front line communities. There are many deep-rooted community groups serving the neighborhoods and small towns who are and will bear the brunt of the hurricane and its aftermath. These are the people who will lead the recovery long after the waters have receded. We will work with partners to establish a community-controlled fund to ensure that 100% of the money raised reaches communities directly impacted by the storm. By using the Jemez principles we have signed onto, and by partnering with other organizations and groups that adhere to the same principles, we seek to establish a just distribution of funds. We will also encourage other organizations use similar principles. Please see our similar Hurricane Harvey response for more information on our transparency and distribution process. Thank you for your help - you can donate here. Hop Hopkins is the director of strategic partnerships for the Sierra Club. 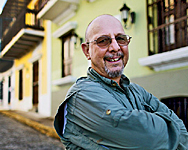 José Menéndez is the president of Sierra Club Puerto Rico. Frank Jackalone is the chapter director of Sierra Club Florida.